ATTENTION THIS IS A TWO PART PROJECT THE CONTEST WILL REWARD THE BEST DESIGN(50 dollars reward) AND THEN COMPLETION OF HTML TEMPLATES(100 dollars reward) TOTAL 150 DOLLARS FOR THE PROJECT. The tool has three main areas/components where content is posted under each pilar. 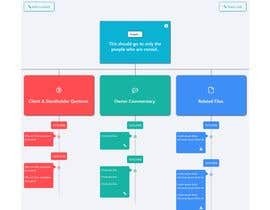 Stakeholder/clients content(this is where clients can post commentary/questions), Owner content(creator and manager of topic shares thoughts, comments, links) and Files(this is where all files uploaded are bucketed). Current layout doesn't work well and is older in design. 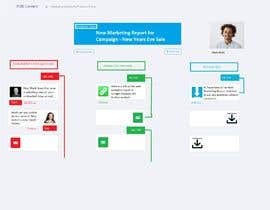 Looking for an updated attractive concept that takes the components in the attached image page and turn them into something efficient and attractive while maintaining the three separate types of contents/pilars, timeline documentation and general theme of a collaborative communication/sharing tool. Ive shared a mockup(page 1 sample)I created that I like and think the general direction and layout should be but open to better or more attractive views. please message me soon .because I will covert your psd or any other file to html with 100% responsive. please check #2 & can we discuss in private chat?